“The Maiden Voyage of The Destiny Unknown” by Nicholas Ponticello takes place 200 million years into the future. The inhabitants of Earth have had to resort to living underground because the planet is so burned up from the dying sun. Knowing that the situation will only get worse, the New World Population Project is created. The goal of this project is to send fifty space travelers, including a dog, a parrot, and a chimp to inhabit Nissan Sentra, an earth-like planet that is twelve years away. Each of the human travelers is genetically selected with the intent that they will help repopulate the new planet. Well, everyone except for the captain’s son that is, who has an IQ of only 80. Fortunately, for the travelers, they bring along a supply of food that will feed fifty people for fifty years. When their twelve-year journey doesn’t turn out quite like expected, the group soon finds themselves continuing on in search of another planet that will support human life. Shortly into the next phase of their travels, they find that humans are not the only inhabitants of the universe. They also learn that they can’t be friends with everybody that sends out an alien signal seeking contact. Back on to the next part of their journey, the group experiences many more misadventures that will eventually lead them to the perfect planet, many, many years later. I absolutely loved reading this laugh-out-loud, intelligently written, science fiction adventure. As a huge Douglas Adams Hitchhiker’s Guide to the Galaxy fan, I was happy to find this author, and plan on becoming a huge Nicholas Ponticello fan. His application of what appears to be real science made the story seem more plausible, and the eccentric characters really brought the story to life. The best part of all is that the author has ideas so creative I was thrown off guard several times. An example of this would be the source of nutrition that the aliens holding them captive came up with for the group. Other times I was laughing out loud, even though in reality some things would be tragic, like the ball game played with the dog on Nissan Sentra. 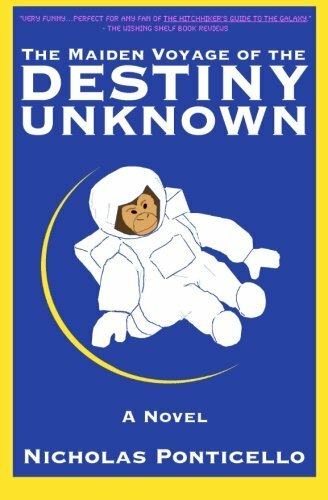 You have to read “The Maiden Voyage of The Destiny Unknown” by Nicholas Ponticello for yourself to know what I am talking about because I am not going to spoil it!